Are you one of the more than 1.7 million people who have watched Sugar: The Bitter Truth on YouTube? Dr. Robert Lustig, a nationally-recognized authority on obesity and UCSF Professor of Clinical Pediatrics, takes us on a 90-minute tour through the biochemistry and politics of sugar, putting his finger on the root cause of our present obesity epidemic: sugar. Much more than that, he lays out the evidence for how our historically high intake of sugar (HFCS and sucrose) is the smoking gun for the Western lifestyles diseases of Type 2 Diabetes, Metabolic Syndrome, Obesity, many types of Heart Disease—and quite possibly Cancer. Dr. Lustig’s case against sugar is much more than compelling—it’s convincing. So much so that a 90-minute biochemistry lecture gets over 50,000 views per month. In great detail, Dr. Lustig identifies the main culprit, fructose. Fructose is a chronic toxin, metabolized only by the liver and responsible for insulin resistance—the common denominator in Metabolic Syndrome, Type 2 Diabetes and Obesity. Dr. Lustig points out in Sugar: The Bitter Truth that the toxicity of sugar shouldn’t really be too much of a surprise—the most controlled substance on the planet is alcohol, which comes from the fermentation of sugar. This is the most important news in health care today, but you are not going to hear about it. Researchers like Lustig know they are right, and they have evidence and hard science backing up their claims, but the long-term studies are only beginning. And there are of course political and commercial interests that will fight the truth down to the last teaspoon. Do you remember the fight the tobacco industry put up? Imagine the resistance and resources that the soft drink industry and food producers will put up. Not to mention the government—do you think we are ready to tell the world that our food exports are toxic? That there is a link between sugar and cancer? That is why I have written this book. 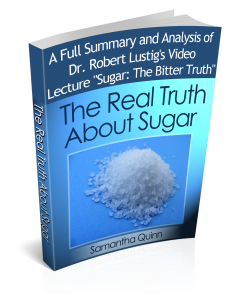 Dr. Lustig’s charm and charisma make Sugar The Bitter Truth extremely watchable, but this is a message that needs wider distribution—and in a medium that lends itself better to close study. We need to be able to see his ideas, findings and theories in black and white so that we can absorb it all. I have even included time markers so that you may easily reference the video—and a short summary overview for those who have not seen the video. This material deserves that kind of studious treatment. Dr. Lustig, I believe, ventures pretty far out on his professional limb to give us this information, and we must do our part to take it from there. We are going to have to make significant changes in our diet and lifestyle, and knowing the real truth about sugar is the important first step.